We&apos;re not sure what it is with Australians (or anyone) and blackface, but they seem to love it. Qantas Airways recently named the winners of its Twitter contest; the two fans will be sent to an international rugby match. These guys show up in afro wigs and blackface, smiling from ear to ear, proving that ignorance is bliss. One dude even went the extra mile and painted his neck black. 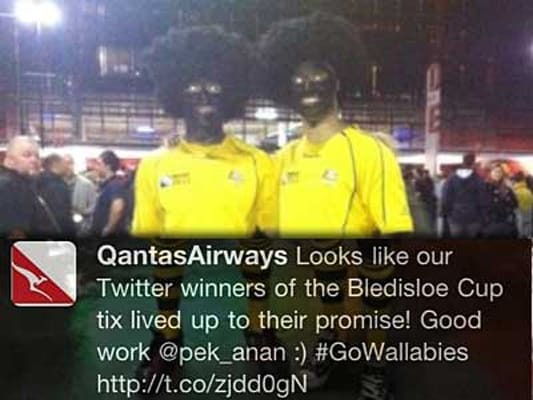 What’s worse is that Qantas posted this to their Twitter account. Not sure what these geniuses were going for, but since there’s no humor here, there’s no point in trying to understand. They really don’t get it.